Introduction Harvesting of hamstring tendon is a very important step in anterior cruciate ligament (ACL) and posterior cruciate ligament reconstruction. Although there are many advantages for using the hamstring tendon for cruciate ligaments reconstruction, there are many disadvantages of the traditional technique for hamstring tendon harvesting. Therefore, we have used a new technique to avoid all the disadvantages and allow for fast, easy, and perfect hamstring tendon graft harvesting. The aim of our new technique for hamstring tendon harvesting is to avoid all complications and difficulties related to graft harvesting and keeping sartorial fascia in a good and repairable condition. Patients and methods We carried out arthroscopic ACL reconstruction using hamstring tendons autograft. We used a new technique for hamstring tendons harvesting. This work was done on 12 patients with an average age of 24 years (20–38) between March 2010 and December 2010. Results Subjective assessment was done according to International knee Documentation Committee rating system. This was defined as four grades as follows: normal (a), nearly normal (b), abnormal (c), and severely abnormal (d). Before ACL injury, 12 (100%) patients considered their knees to have been grade A. Twenty-four months after reconstruction, 11 patients rated their knees as normal or nearly normal. One patient rated his knee as abnormal at 2 years of follow-up. This patient had severe osteoarthritic changes. Conclusion It would be advisable to follow this technique of graft harvesting for all individuals undergoing arthroscopic ACL reconstruction using hamstring tendons to avoid the problems encountered with the standard technique and also to achieve an excellent outcome. Anterior cruciate ligament (ACL) rupture is a common lesion, particularly in sports activity. Various surgical procedures and graft selection have been proposed for ACL reconstruction, such as bone-patellar tendon-bone (BTB), semitendinosus (ST), semitendinosus and gracilis (STG), iliotibial band, allograft, and quadriceps ,,,. In the past years, the central third part of the patellar tendon and hamstring tendons has been the most common type of graft used . The outcomes for STG and BTB graft surgeries have been compared by several authors. Some reports have indicated better knee stability with a BTB graft, , and others showed no difference in clinical outcome between the two procedures ,. More recent studies have pointed out that a patellar tendon graft can cause an increased incidence of anterior knee pain, flexion contracture of the knee, and delayed recovery of the strength of knee extension ,. For this reason, gracilis and ST tendons to perform ACL reconstruction have been used since 1999, obtaining highly satisfactory results. The goal of this article is to describe ACL reconstruction using a quadruple loop of ST and G tendons using a new technique for graft harvesting to avoid any reported complications of graft harvesting using the standard technique and to facilitate easier, perfect, fast, and precise tendon harvesting. We carried out arthroscopic ACL reconstruction using hamstring tendons autograft. We used a new technique for hamstring tendons harvesting. This work was done on 12 patients, with an average age of 24 years (20–38), between March 2010 and December 2010. Ten patients were operated in the subacute phase (from 3 to 12 weeks after injury), and two in the chronic phase (>12 weeks after injury). The affected limb was the right one in eight patients and left one in four patients. Eleven patients were male and one patient was female. There were associated medial meniscus injuries in seven patients, bilateral medial and lateral meniscus injury in one patient, and lateral meniscus injury in one patient. The same technique was used in all patients. A double loop hamstring tendon autograft was taken from ipsilateral knee using a new technique for graft harvesting. After introduction of anesthesia and 1 g of broad-spectrum antibiotic, the patient was placed supine on the operating table. A well-padded pneumatic tourniquet was applied on the thigh of the affected leg. After routine skin preparation, sterilization, and sterile draping, a vertical skin incision over the tibial insertion of the pes anserine tendons was made. Skin incision was positioned midway between the anterior tibial crest and posteromedial border of the tibia. In our technique, the conjoined tibial insertion of the tendons is detached from the tibia by making an inverted L-shaped incision about 1×3 cm through the sartorial fascia to the bone. We create a flap composed of three layers, which are periosteal flap, conjoined tendon layer, and sartorius fascial layer, by dissecting it sharply from the bone. The tip of the flap is grasped with an Allis clamp and lifted away from the tibia. Using tip of the knife, we can separate the periosteal layer on one side and tendinous layer with overlying sartorius fascia on the other side. The tip of the tendinous layer is grasped and lifted away from the tibia, thus protecting the underlying medial collateral ligament. The sartorius fascia layer is picked up with nontoothed forceps and can be easily dissected and separated from underlying conjoined tendon. A right angled-type clamp was used to separate the conjoined tendon from undersurface of the sartorius fascial layer, which was preserved for later closure as an end step before skin closure. The gracilis tendon was sharply separated from the conjoined tendon and grasped with an Allis clamp. 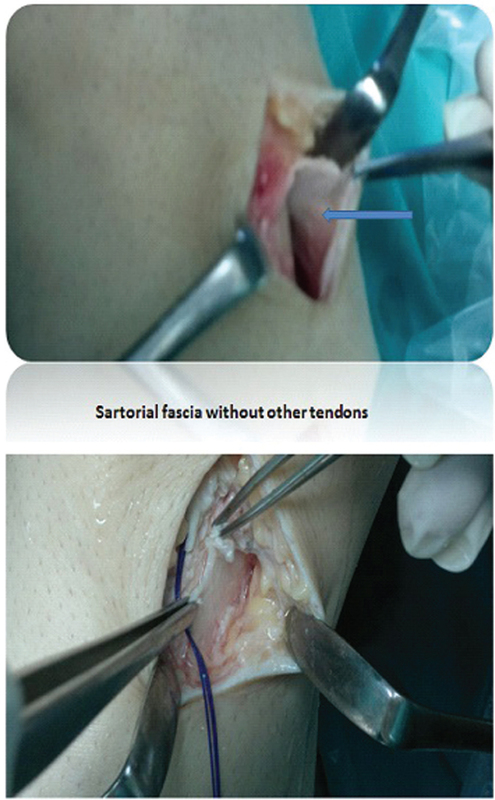 Blunt scissor dissection was used to free the tendon from the remaining fascial attachment between it and undersurface of the sartorius fascial layer. Five throws of a running baseball-style whipstitches were placed in the free end of the gracilis tendon with number 0 Vicryl suture (Shanghai SUCE Medical Technology Development Co. Ltd, Shanghai, China). The tendon could be harvested with a closed-type tendon stripper. The gracilis tendon was harvested by flexing the knee 90° and advancing the tendon stripper parallel to the tendon by slow, steady, rotating motion. The ST tendon was harvested in a similar fashion, and all fascial connections should be released to prevent premature amputation of the tendon. The knee joints were subjected to continuous passive motion from 30′ to 90′ for 48 h. Patients were instructed for nonweight bearing rehabilitation brace for 4 weeks. The sutures were removed 14 days after surgery. Isometric quadriceps muscle exercises were advised 24 h after surgery. Aggressive physiotherapy was started after 2 weeks to achieve full range of motion and adequate muscle strength. Follow-up visits were at 4 weeks and at 3, 6, 12, and 24 months. The grading system recommended by International knee Documentation Committee (IKDC), which incorporates multiple subjective and objective criteria, was used at 2-year follow-up ([Figure 1],[Figure 2],[Figure 3],[Figure 4],[Figure 5],[Figure 6],[Figure 7]) . Figure 1 (a, b) Transverse and vertical incisions. Figure 2 (a, b) Deep dissection and the three layers (fascia, periosteum, and tendons). Figure 3 Cleavage of periosteal layer and tendon and fascia layer. 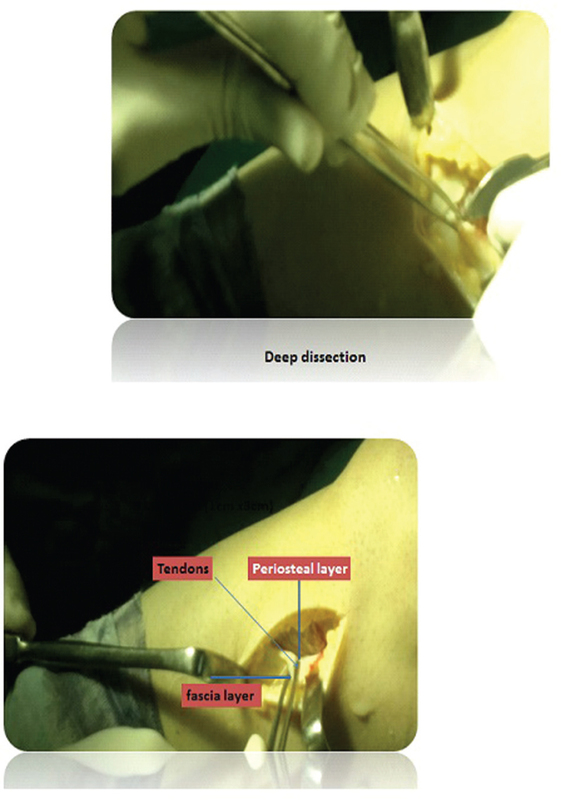 Figure 4 Inspection of undersurface of tendon layer. 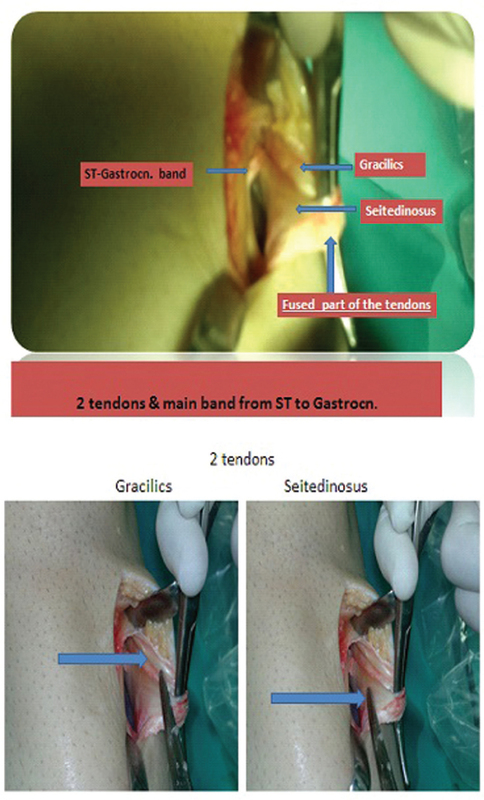 Figure 5 The two tendons and the main band from semitendinosus to sastrocnemius. Figure 6 Gracilis and semitendinosus. 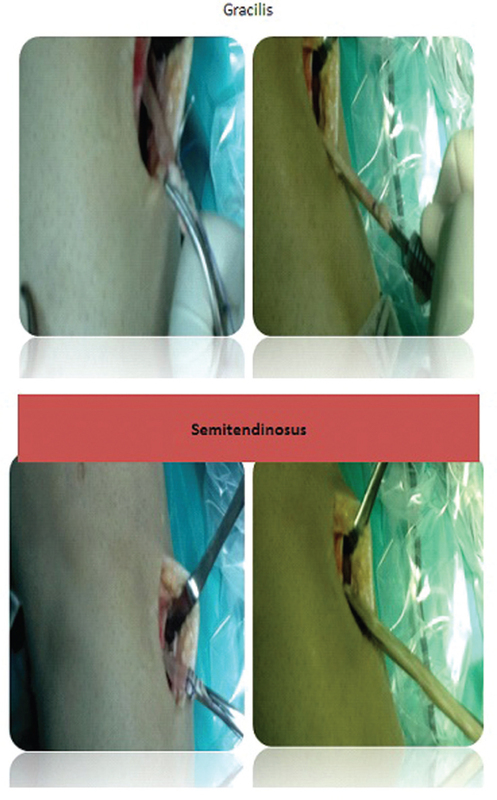 Figure 7 Sartorius fascia and final step repair. Subjective assessment was done according to IKDC rating system, and this was defined as four grades as follows: normal (a), nearly normal (b), abnormal (c), and severely abnormal (d). Before ACL injury, 12 (100%) patients considered their knees to have been grade A.
Twenty-four months after reconstruction, 11 patients rated their knees as normal or nearly normal. One patient rated his knee as abnormal at 2 years of follow-up. This patient had severe osteoarthritic changes. At 2 years, all except one patient could undertake moderate to severe activities without pain. Light activity caused minimal swelling in one patient at 2 years of follow-up. At 2 years, four patients had lost extension of 3′–5′. In all patients, loss of extension was less than this. Loss of flexion was less than 5′ in all patients at 2 years. Only one patient had loss of flexion 20′ at 2 years of follow-up. Moderate tenderness over the site of incision occurred in three patients and slight symptoms in another three patients. The remaining six patients had no discomfort at the harvest site. Lachman and pivot shift testing showed all patients with laxity of grades 0–1 (http://www.sportsdoc.umn.edu/Clinical_Folder/Knee_Folder/Knee_Exam/pivotshift.htm). Degenerative changes as demonstrated by radiography were most severe in one patient who had affected menisci (medial and lateral). A total of 11 (91.6%) patients were able to hop 90–100% of distance achieved using the uninjured leg, but one (8.4%) patient refused to perform the hop test. The overall rating is determined from the lowest grade recorded in any of the four groups of the subjective assessment, symptoms, range of movement, and ligament stability among 12 patients: six (50%) patients were grade as normal (a), five (41.6%) patients as nearly normal (b), and one (8.4%) patient as abnormal. The median Lysholm knee score was 90 (69–100) at 2 years of follow-up. One patient had superficial skin infection 3 weeks postoperatively, which was treated by serial dressing and parenteral antibiotics. Hamstring tendons harvesting can be performed through a vertical or oblique skin incision centered over the tibial insertion of the pes anserine tendons. When the transtibial tunnel technique is used as in our technique to drill the femoral tunnel, it is important to center the vertical skin incision midway between the anterior tibial crest and the posteromedial border of the tibia to allow the tibial tunnel to be positioned along the anterior fiber of the medial collateral. When the femoral tunnel is to be drilled by the anteromedial portal technique, the vertical skin incision can be positioned closer to the anterior crest of the tibia . The vertical skin incision is extensile and can be easily extended to harvest a patellar tendon when required. The oblique skin incision provides better proximal exposure of the tendons and requires less skin retraction during drilling of the tibial tunnel. The anatomic course of the infrabranches of the saphenous nerve also make them less vulnerable to injury when the oblique incision is used. However, the saphenous nerve can be injured if the oblique incision is positioned too close to the posteromedial corner of the tibia or sharp dissection is extended back into this region . In our technique, the tendons can be harvested simply with no complications, because this technique gives an excellent view of the internal aspect of the pes and allows the surgeon to visualize and identify any of the associated anatomic variations or variable tendon attachments to the tibia, which are common . In our technique, the conjoined tibial insertion of the tendons is detached from the tibia with an overlying sartorius fascia by making an inverted L-shaped incision. Our technique is different from the inside-out technique described by Brown et al. in the manner of dealing with sartorius fascia. In our technique, the fascia is left intact in a repairable condition and so can be attached back to its insertion site. This reattachment can play a role in postoperative wound healing and rehabilitation. In our technique, no sharp dissection is required and so complications related to this type of dissection can be avoided. It would be advisable to follow this technique of graft harvesting for all individuals undergoing arthroscopic ACL reconstruction using hamstring tendons to avoid the problems encountered with the standard technique and also to achieve an excellent outcome. Zarins B. Combined intra-articular and extra-articular reconstructions for anterior tibial subluxation. Orthop Clin North Am 1985; 16:223–226. Staubli HU, Jakob RP. Central quadriceps tendon for anterior cruciate ligament reconstruction. Part I: morphometric and biomechanical evaluation. Am J Sports Med 1997; 25:725–727. Marcacci M, Zaffagnini S, Iacono F, Neri MP, Loreti I, Petitto A. Arthroscopic intra and extra-articular anterior cruciate ligament reconstruction with gracilis and semitendinosus tendons. Knee Surg Sports Trumatol Arthrosc 1998;6:68–75. Marks PH, Cameron M, Fu FH. Reconstruction of the cruciate ligaments with allogeneic transplants: techniques, results and perspectives. Orthopade 1993; 22:386–391. Marcacci M, Molgora A, Zaffagnini S, Vascellari A, Iacono F, Presti ML. Anatomic double-bundel anterior cruciate ligament reconstruction with hamstrings. Arthroscopy 2003; 19:540–546. Aglietti P, Buzzi R, Zaccherotti G, De Baise P. Patellar tendon versus doubled semitendinosus and gracilis tendons for anterior cruciate ligament reconstruction. Am J Sports Med 1994; 22:211–218. Holmes PF, James SL, Larson RL, Singer KM, Jones DC. Retrospective direct comparison of 3 intr-articular anterior cruciate ligament reconstructions. Am J Sports Med 1991; 19:596–600. Marder RA, Raskind JR, Carrolo M. Prospective evaluation of arthroscopically-assisted anterior cruciate ligament reconstruction: patellar tendon vs semitendinosus and gracilis tendons. Am J Sports Med 1991; 19:478–484. Otero LA, Hutchson L. A comparison of the doubled semitendinosus/gracilis and central third of the patellar tendon autografts in arthroscopic anterior cruciate ligament reconstruction. Arthroscopy 1993; 9:143–148. Kleipool AE, van Loon T, Marti RK. Pain after use of the central third of the patellar tendon for cruciate ligament reconstruction: 33 patients followed2-3 years. Acta Orthop Scand 1994; 65:62–66. Wilk KE, Keirns MA, Andrews JR. Anterior cruciate ligament reconstruction rehabilitation: a six-month followup of isokinetic testing in recreational athletes. Isokinetic Exerc Sci 1991; 1:36–43. Anderson A. Rating scales. In: Fu F, Harner C, Vince KG, editors. Knee surgery. Maryland: Williams and Wilkins; 1994. pp. 275–296. Lysholm J, Gillquist J. Evaluation of knee ligament surgery results with special emphasis on use of a scoring scale. Am J Sports Med 1982; 10:150–154. Brown CH, Chen N, Darwish N. Hamstring tendon autograft for anterior cruciate ligament reconstruction. In: Cole B, Sekiya JK, editors. Surgical techniques of the shoulder, elbow, and knee in sports medicine. Philadelphia: Saunders, Elsevier; 2008. pp. 619–640. Soloman CG, Pagnani MJ. Hamstring tendon harvesting: reviewing anatomic relationships and avoiding pitfalls. Orthop Clin North Am 2003; 34:1–8. Levy M, Prud’homme J. Anatomic variations of the pes anserinus: a cadaver study. Orthopedics 1993; 16:601–606.